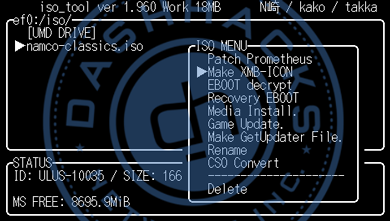 Hack your Sony PSP : ISO Tool v1.975 Released ! So I don’t know if you’re familiar with the latest version of Takka’s ISO Tool or not, but I just downloaded it after reading about this “Fake NP data” feature. While I’m not 100% clear, mainly because of the poor Google Translation, it seems v1.975 can patch EBOOT.BIN game files, NPDRM’ing ISOs to appear as downloaded PSN content, letting you load ‘em up … possibly without HEN or CFW? And that’s what I’m not clear on. I’ve been playing with ISO Tool v1.975 on my PSPgo… I have a few legitimately purchased games from PSN installed; however, my PSP isn’t “activated” (that’s another story) and I can’t activate it with PSN being down, thus I’m stuck with error 8010850F (“To use this content, you must activate the system.”). The translated change log can be found on the download page.